Sourced from some of the finest Caribbean sugarcane. Spiced Rum is made up of twelve spices and other natural flavors. 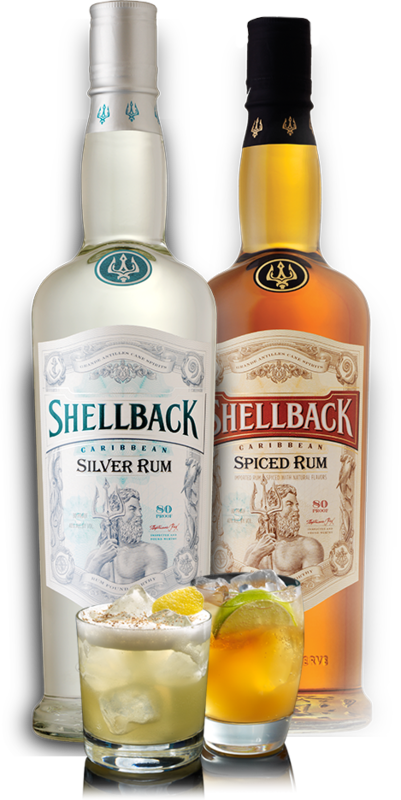 Shellback® Silver is a bright, clean-tasting rum for any occasion. Its floral overtones are layered with the suggestion of vanilla and tropical fruit to provide a sweet, smooth taste that's just right for sipping or mixing in one of our signature cocktails. Shellback® Spiced is a flavorful, medium-bodied rum of remarkable quality. Its 12 exotic spices combine to offer unique aromatics and layers of caramelized vanilla, brown spice, cinnamon, and honey. With a distinctive yet versatile profile, it is pleasantly warm with a clean finish and makes for a tasty shot, mixes nicely with soft drinks and serves as the perfect companion for hot drinks. Learn more about the storied past of the world's oldest distilled spirit and its significance to life on the high seas over the centuries. Discover how rum makes its way from our Caribbean sugarcane crop all the way to your cup. Whether you're in the mood for a simple classic or down to mix it up, we've got a signature cocktail for every occasion. Assemble your crew and tell them to prepare their taste buds for a flavor odyssey. You're breaking out the good stuff.